The fall crafting is alive and well friends – though around these parts it sure doesn’t feel at all like Fall. We have been having record breaking hot days! It’s like Mother Nature remembered that she forgot to give us summer and is making up for lost time. When we are not out in the shade and sprinkler it is actually too hot for us to safely be outside. So, we have kept up with our Fall crafting. We are hoping our persistence will convince Mother Nature that we are indeed ready for Fall. 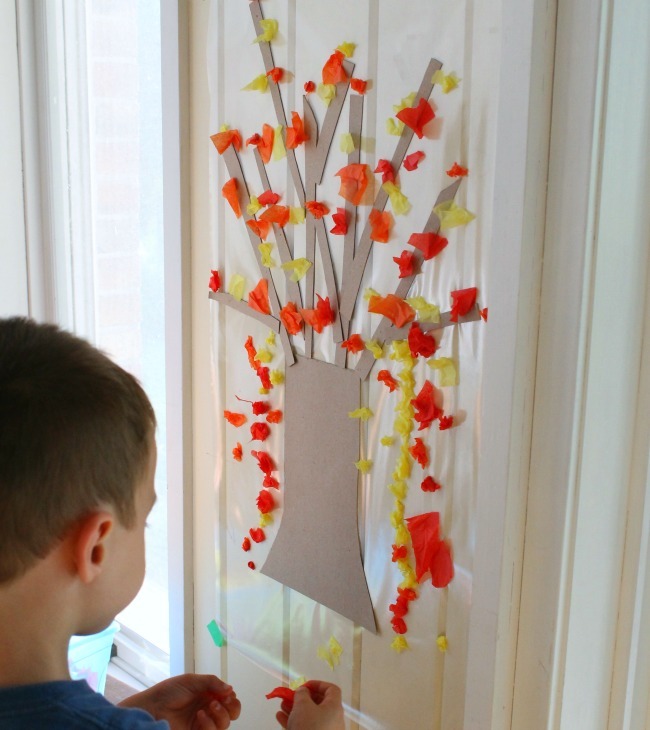 This super simple Fall craft is fabulous for toddlers, preschoolers, and bigger kids too. It is so easy to set up and keeps those little ones busy for hours! 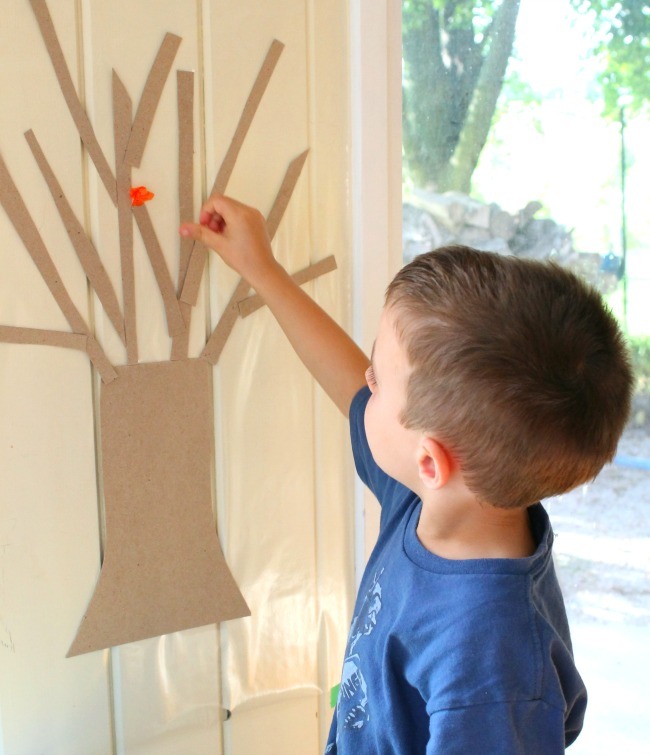 It is great for strengthening fine motor skills and has those little arms working on a vertical service too. 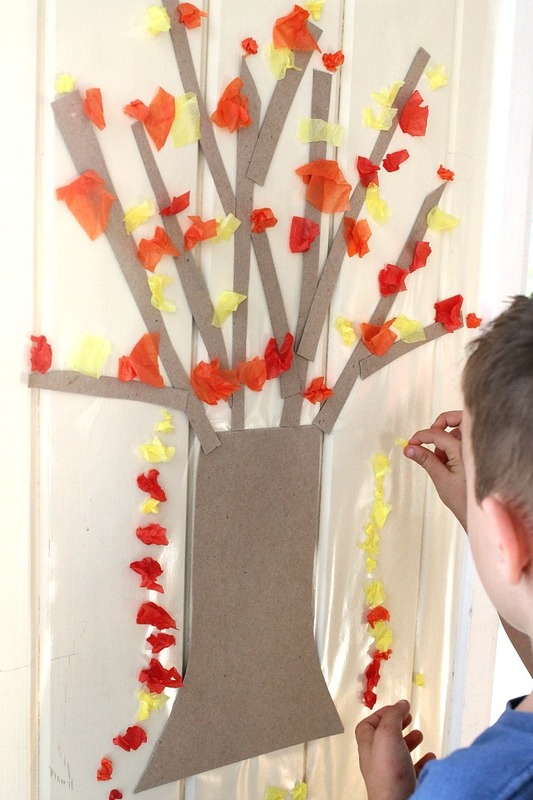 For this sticky Fall tree I cut a piece of clear contact paper and painters taped it up to the wall, sticky side out. I then cut up red, yellow, and orange tissue paper. 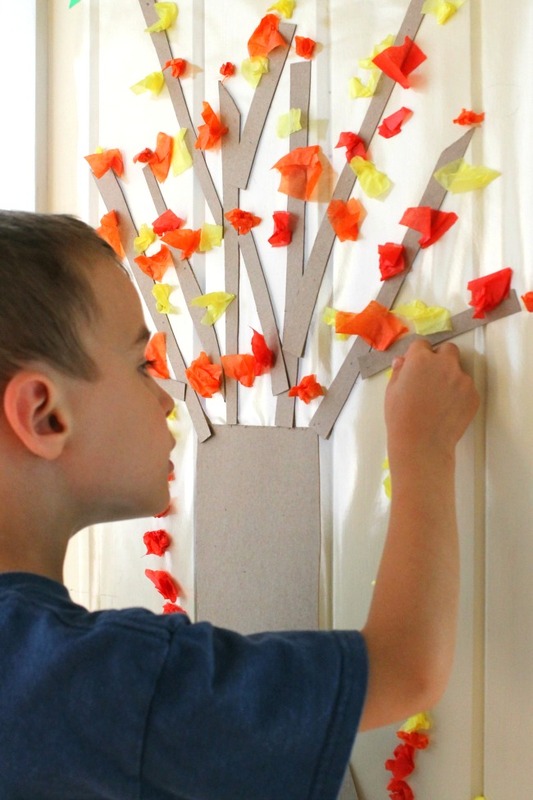 Little hands could definitely help with this – and ripping tissue paper is a great way to strengthen those fingers too. Next, I cut some brown cardboard from a cereal box into a tree trunk shape and some branches too. I stuck this on so it would resemble a bare tree. That was all that was needed – and then my little ones got to sticking! This neat little craft stayed on our wall for a week with the box of tissue paper below it. Every day a little hand or two would venture over and add a few leaves. It really was very engaging. Here’s hoping it will be engaging for the little hands around your neck of the woods too! Thank you so much for reading friends. I hope you are staying cool and having a fabulous day! Another really useful odea, I’m so glad I found you Sarah!